The culture of India described as ‘Sa prathama sanskrati vishvavara’, which means – The first and supreme culture in the world. The customs, celebrations, clothing, arts, architectural styles, religions and languages are differs by different regions of the country. By concerning the cultural importance UNESCO described 25 different sites in India as world heritage sites. It provides a way of international co-operation to protect important cultural sites. At same time the ‘world heritage site’ label also represents universal value of such sites. Followings are list of 10 important cultural world heritage sites in India. Humanyun’s tomb is the first ever garden- tomb on Indian sub continent, located in Delhi. 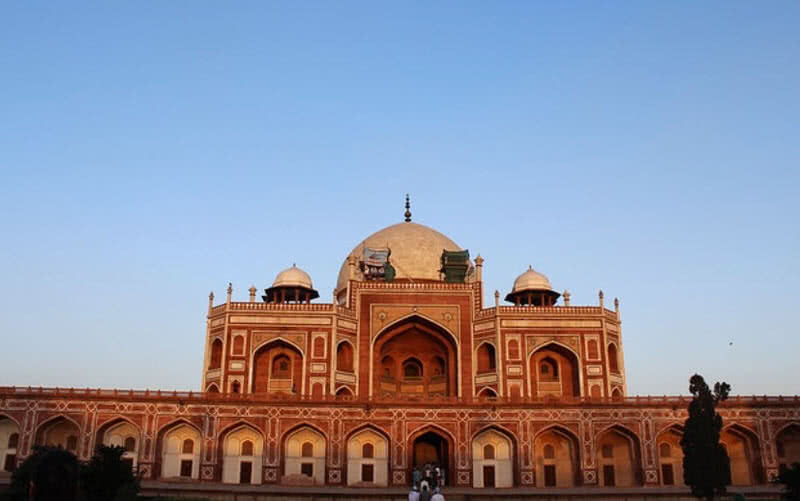 It was built for Mughal emperor Humayun, commissioned by his widow Bega Begam in 1570. It have great importance in the history of evolution Mughal architecture. The tomb also culminating the construction of Taj Mahal. In 1993 UNESCO described Humayun’s tomb as a world heritage site. Persian architect Mirak Mirza Ghiyas was one who designed this tomb. Mughal structural style was used for this tomb with causeways and channels, situated in the center of a large garden. Red sand stones and marbles are the main materials used for the construction of this tomb. The chamber of the complex have octagonal design. The interior of the tomb also have interconnected galleries. 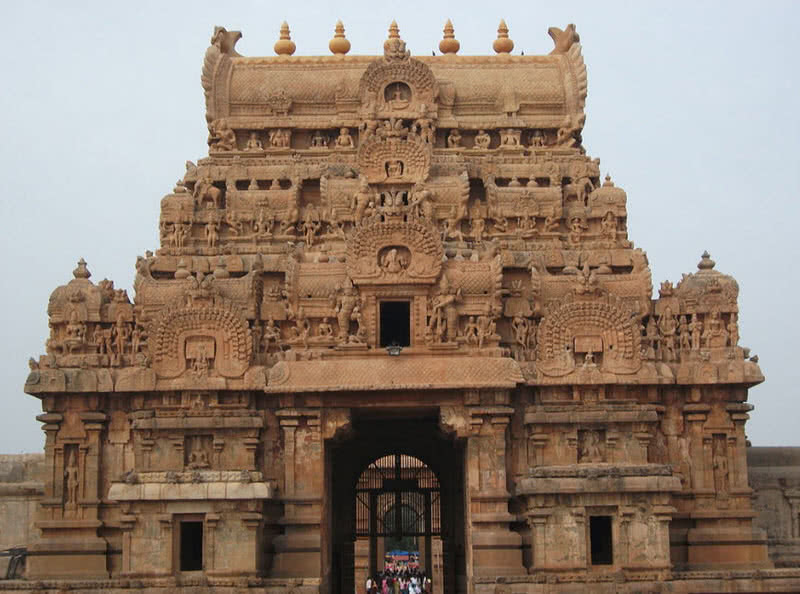 The great living chola temples includes Brihadisvara temple at Thanjavur, Brihadisvara temple at Gangaikondacholisvaram and Airavateswara temple at Darasuram. These temples were built by Kings of Chola empire between 11th and 12th century AD. These temples reveals importance of Tamil culture and development of Chola architecture. The massive Brihadisvara temple at Thanjavur considered as the greatest gift from Chola architect and. The great living Chola temple became a world heritage site in 1987. Brihadisvara temple was constructed between 985 and 1012 CE, dedicated for lord Siva by Chola king Rajaraja I. The temple contains high quality sculptures and bronzes. The walls of the temple decorated with elegant and expensive mural paintings. Eighty one of one hundred and eight karanas, key transitions in bharathanatya also carved on the walls of Brihadisvara temple. 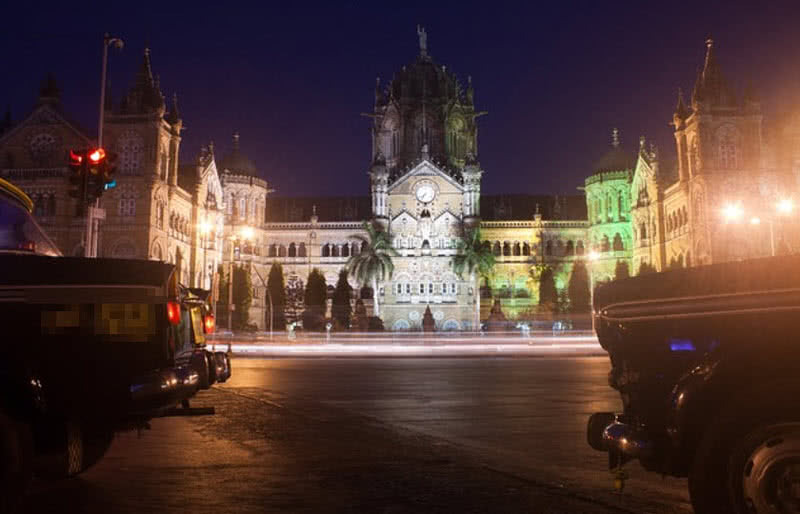 Chaatrapati Shivaji terminus is a historic railway station and a world heritage site located in Mumbai. The station was formerly known as Victoria terminus. In 1996 the name of the station changed as Chaatrapatu Shivaji terminus. It was built in 1887 to commemorate golden jubilee of Queen Victoria. This busiest railway station in India is an perfect example of Victorian Gothic Revival architecture and traditional Mughal designs. Nowadays over 3 million commuters use this station everyday. The construction of this station was started in 1878 and completed in 1888, designed by British architect Frederick William Steven. The station presents both British and Indian architectural styles. There are also 3D carvings of animals, flowers, symbols and human faces on the walls of Chaatrapati Shivaji terminus. The hill forts of Rajasthan comprise six majestic forts of the state – includes Chittirgarh fort, Jaisalmar fort, Amber fort, Gagron fort, Rathambore fort and Kumbhalgarh fort. These six forts are located on rocky Aravali mountains in Rajasthan. UNESCO included hill forts of Rajasthan within list of world heritage sites in 2013. These forts are built between 8th and 18th centuries, protects palaces, temples and major trading centers, reflects power of Rajput princely states. The hill forts of Rajasthan features housing for military guards and structures for water harvesting. Out of these six forts Chittorgarh fort reflects varieties of architectural styles ranging between 8th and 18th centuries. In fact it is the largest fort in India, covers an area of 280 hectares. The Chittorgarh fort, Kumbhalgarh fort and Rathambore fort are also protected by Archaeological survey of India. 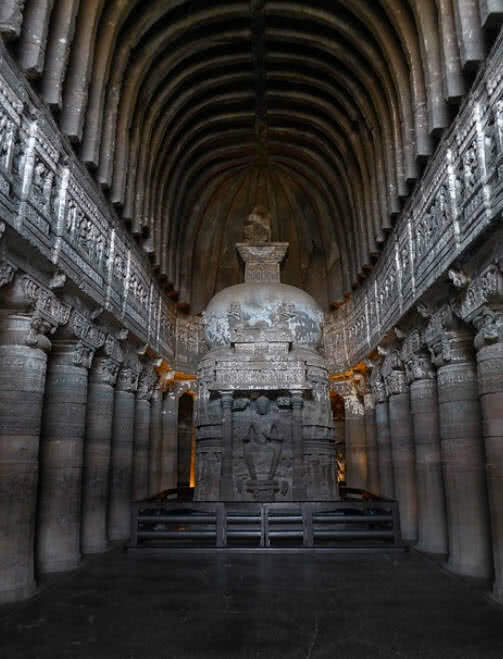 Ajanta caves is a series of 30 rock cut Buddhist rock cut caves located in Aurangabad district of Maharashtra. Some of these caves dated back to 1st and 2nd centuries BC. Ajanta caves preserves some of masterpieces of Buddhist art, paintings and sculptures of Buddha. This site listed on world heritage sites by UNESCO in the year 1983. 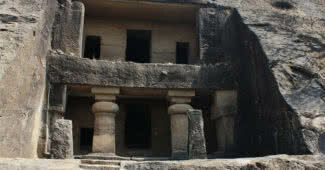 Ajanta caves are carved were carved in 2nd century BC, on horse shoe shaped rock. For next 9 centuries these caves were used by Buddhist monks as prayer halls. But these caves were abandoned in AD 650 and rediscovered by a British officer in 1819. Out of 30 different caves five caves are stupa monument halls those are known as chaityagruhas, rest of the caves are viharas, monestic hall of residence. Ajanta caves features colorful paintings and murals depicting the life of Buddha. The Mahayana prayer hall, Cave 26 of Ajanta caves contains a large statue of reclining Buddha, highlighting the death of lord Buddha. Remaining caves also decorated with sculptures and paintings of Buddha. Konark Sun temple is a giant chariot shaped Hindu temple dedicated for the Sun God, Surya. This temple is located in district of Konarak, on the shores of Bay of Bengal. Konark temple reflect architectural marvel and extreme devotion of Ancient India. It represent the chariot of God Sun, have 24 carved wheel measuring 3 meter in diameter and these wheels are drawn by seven horses. Konark temple was built back in 13th century by King Narasimhadeva I and became a world heritage site in 1984. The Koanrk temple follows kalinga temple architecture. 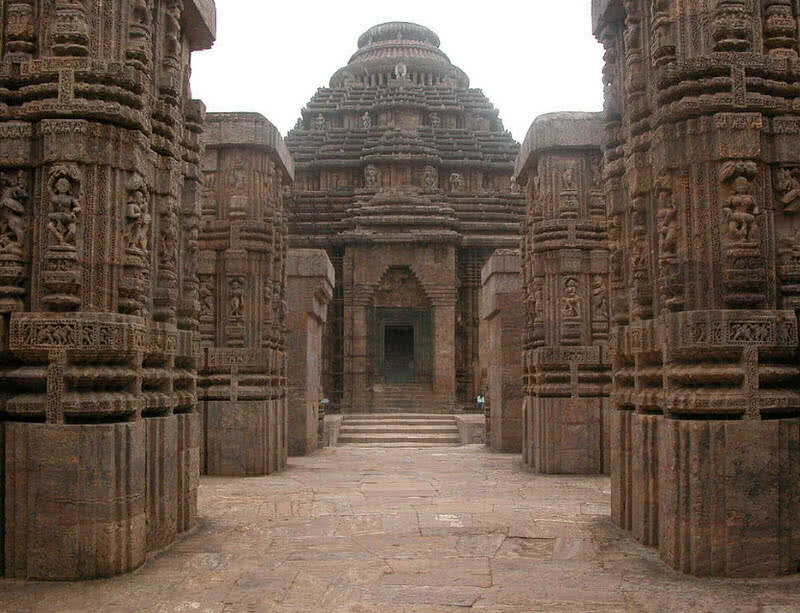 The carvings and architectural style of Konark temple also represents the passage of time or different seasons. The 12 different wheels represents 12 months in an year, the seven horses of chariot represents 7 days in a week and the spokes on the wheels of chariot create Sun dial, tells different stages of a day. The walls of the temple are also carved with sculptures of musicians and dancers. The Buddhist site at Sanchi is the oldest extant Buddhist sanctuary date back to 1st and 2nd centuries BC. This site consist of group of Buddhist monuments such as pillars, temples, monasteries and palaces. The foundations of religious center at Sanchi was laid by Emperor Asoka in 3rd century BC. He also erected a great stupa at Sanchi. It is the oldest preserved stone structure in India. By considering the historical and cultural values UNESCO listed this site as a world heritage center in 1989. 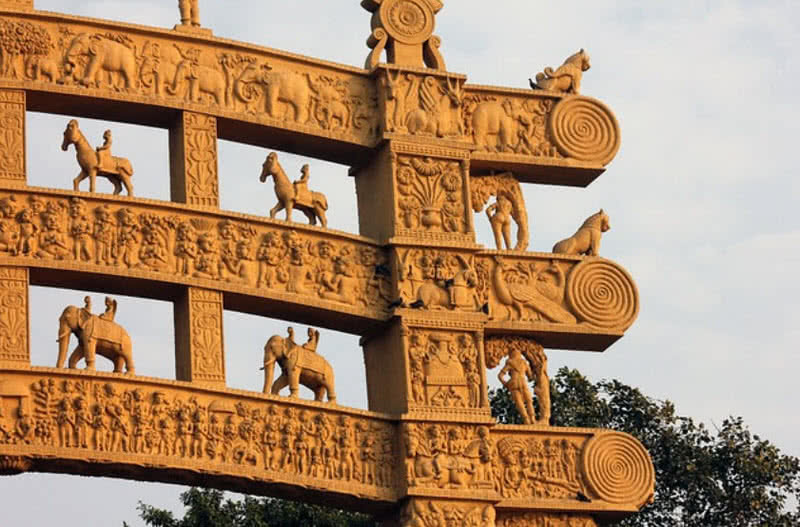 The carvings on great Sanchi stupa depict Jataka stories and life events of Lord Buddha. There are also number of other stupas and pillars erected by Asoka the Great. This religious site at Sanchi served as a main center of Buddhism between 3rd century BC and 1st century AD. After the spread of Hinduism Sanchi abandoned, for long 600 years and rediscovered by General Taylor in 1818. It is the second tallest minar in India stands at height of 72.5 meter, located in Delhi. This monument is an outstanding example of Indo-Islamic Afghan architecture. The surrounding area also contains number of tombs, mosques and summer palaces. The Quwwat-ul-Islam mosque at this archaeological site is the oldest mosque in Delhi, ghurids architectural styles was used for it’s construction. UNESCO inscribed Qutb minar and it’s monuments on world heritage list in 1993. 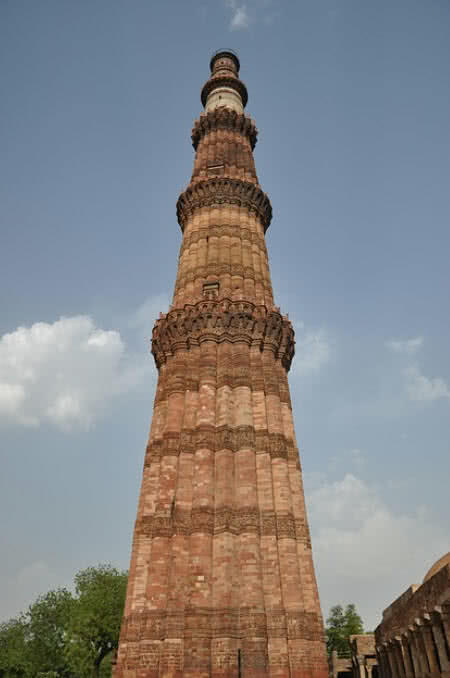 The construction of Qutb minar begun by Qutbu I-Din Aibak in 1192 and completed by his successor IItumish in 1368. Red sand stones and marbles are the main materials used for it’s construction. Each storey of Qutb minar is separated by beautifully decorated balconies. Qutb minar also features numerous Arabic and Nagari inscriptions. 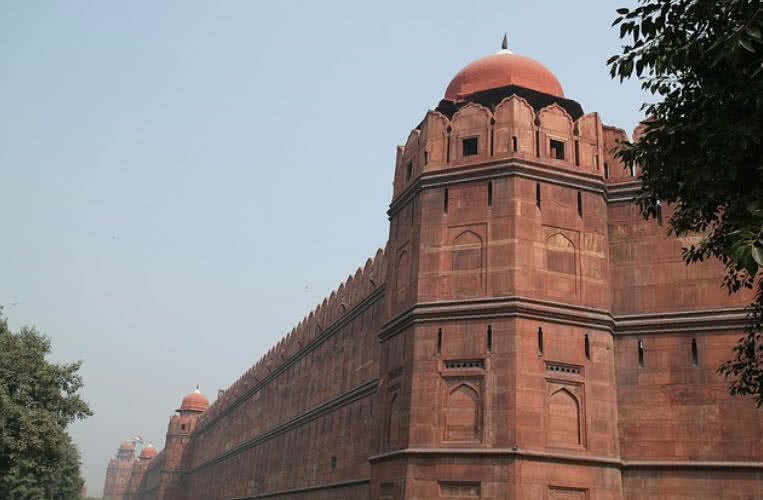 Red fort is the fortified palace that built for fifth Mughal emperor Shah Jahan in Delhi in 1648. Red fort is situated near Salimgarh fort built by Sultan Islam Shah Suri in 1648, together which forms red fort complex. The design of red fort represents the fusion of Mughal, Islamic, Persian, Timurid and Hindu architectural styles. Red fort covers and area of 255 acres and have 2.4 kilometer long defensive walls. This site became a world heritage site in 2007. The Mughal emperors of India used red fort as their residence for more than 200 years, from 1657 to 1857. More than two third of inner structures red fort were destroyed by British with end of Mughal reign in the year 1858. But the towers and wall of fort remained unharmed. The main gate to red fort is Lahori gate located at the Western part of the fort, named after it’s orientation towards Lahore city. After Independence red fort continued to be used as a military cantonment. Every independence day since 1947 national flag has been raised at the ramparts of Lahori gate by Prime Minister of India. 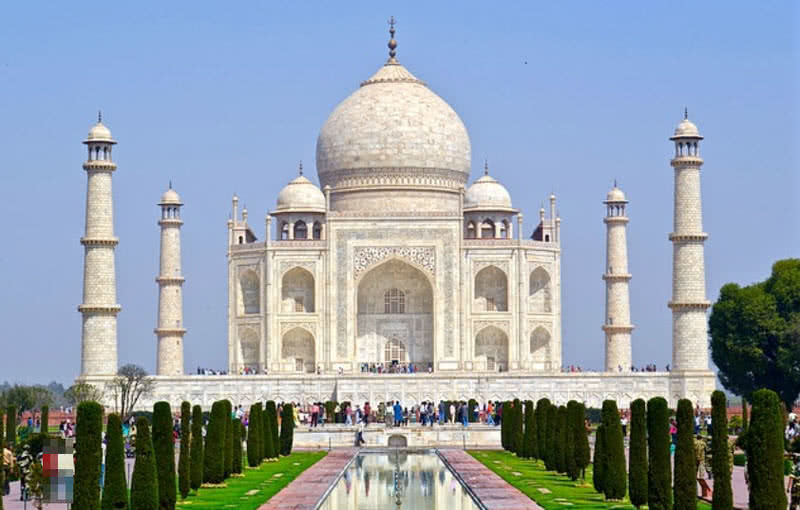 Taj Mahal is the supreme icon of India located in the city of Agra. This mausoleum remains as most popular example of Mughal architecture and known as ‘Crown of Palaces‘. This iconic monument was built by emperor Shah Jahan in the memory of his wife Mumtaz Mahal. In 1983 Taj Mahal became a world heritage site. It took 21 years for the construction of Taj Mahal starting in the year 1632. Abd l-Karim Ma’mur Khan and Ustad Ahmad Lahauri are principal designers of Taj Mahal. Material were imported from all over India ad Central Asia for it’s construction. The four side of the Taj Mahal are perfectly identical and four minarets at the corners provides three dimensional effect to the monument. The walls of Taj Mahal decorated with precious stones from Baghdad, also inscribed with lines from holy Quran. Taj Mahal is surrounded by beautiful garden, reflecting pool, a mosque and number of other significant buildings, encompasses 17 hectares of area. Taj Mahal appears to be in different color at different time of a day, It takes pinkish hue color at morning, milky white in evening and golden color at night.